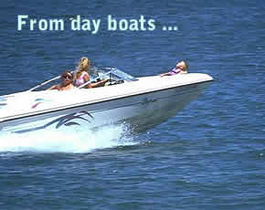 For over 50 years, McCready Boatyard and Railway has been helping Maryland boaters reap more enjoyment from their powerboats. Located on Hungerford Creek (off the Patuxent River), we have repaired or replaced Mercury, Cat and Yanmar diesel engines, kept Crusader gas engines at top performance level. From inboard motors to an outboard motor on your center console fishing skiff, our seven mechanical specialists are ready to help you. We do fiberglass repair work, both structural and cosmetic. We can fix a leaking port, repair a damaged hull to deck joint, a blistered bottom, or repaint an entire boat. Many wooden boat owners needing special marine specialists for repairs come to McCready. 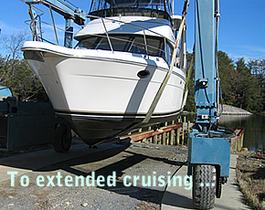 Your motoryacht may need shaft work and/or prop reconditioning. Give us a call. Talk to David Abell today. Call 410.326.2359. Tell him about your powerboat. Or email David now! The content and layout of this website was handled by Thieme Creative Media. The firm utilized Network Solutions' Web Site Builder tool.